Street, at the Metropolitan Museum, an exhibit that features an hour-long video by James Nares edited from 16 hours he shot in September 2011 from a car moving through the streets of New York, is built on looking local. 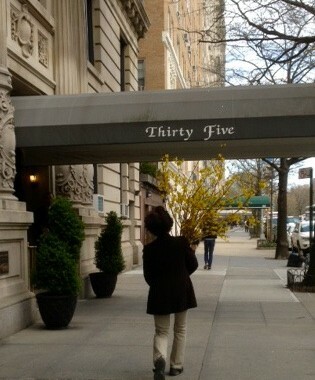 (The Photographer. 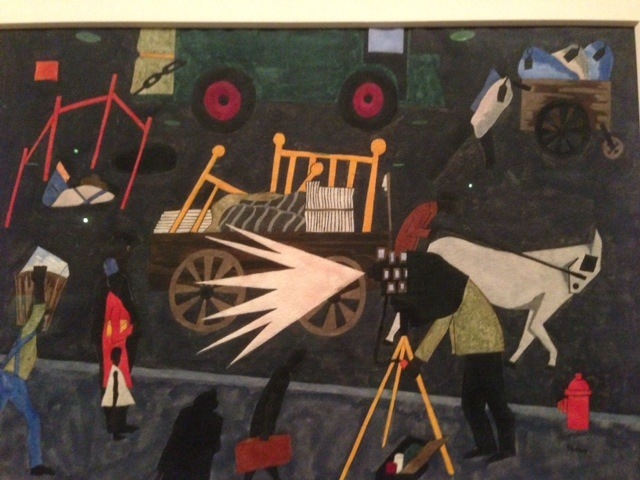 Jacob Lawrence. 1942, above, is from the exhibit) . Nares has scored the film to the 12-string guitar music of Thurston Moore and incorporated into the exhibit two rooms of objects from the museum’s collection. The slow-motion film is more purely beautiful than I had anticipated and the collection of objects in the adjoining rooms more intensely evocative. in contact with the local conditions which confront us…[and] in the perfection of that contact is the beginning not only of the concept of art among us but the key to the technique also. — Contact. I, 1920.
art is the product of a certain sort of living contact that can be made to live…in no other way. Street seems to arise from that “living contact with local conditions” crucially and powerfully rendered, and at the same time, for me, became more “multi-local” the longer I stayed. Rue Mouffetard, Montgomery, Alabama, an unnamed Western (America) street among the assembled art from the collection began this movement out in place as the collected artifacts did in time. Among the assembled objects in Street are renderings of hands, feet, faces, streets, wheels, axles, soles of shoes, accessible before, after, and in between the colorful, continuously running film footage in the darkened center room. Particularly moving are the fragments and the abstracts — the marble foot in sandal, the marble hand holding an object, the ancient Egyptian hand carved in limestone, and Franz Kline’s “Study for Flanders”. The exhibit’s wall text arises from the conversations among James Nares and museum curators; one panel captures Berenice Abbott’s “voracious eye”. Suppose we took a thousand negatives and made a gigantic montage combining the elegances, the squalor, the curiosities, the monuments, the sad faces, the triumphant faces, the power, the irony, the strength, the decay, the past, the present, the future of a city — that would be my favorite picture.I had read reviews and blurbs about the exhibit before going, extracted a list of nouns from what I’d read, scribbled them on a piece of paper, and took them with me. This past Monday, a fellow Southerner, a surgeon at the Hospital for Special Surgery in Manhattan, good-naturedly bemoaned New York City springtime and recounted a recent phone call with his mother in SC and his difficulty in answering honestly her question whether spring had arrived where her son lives. 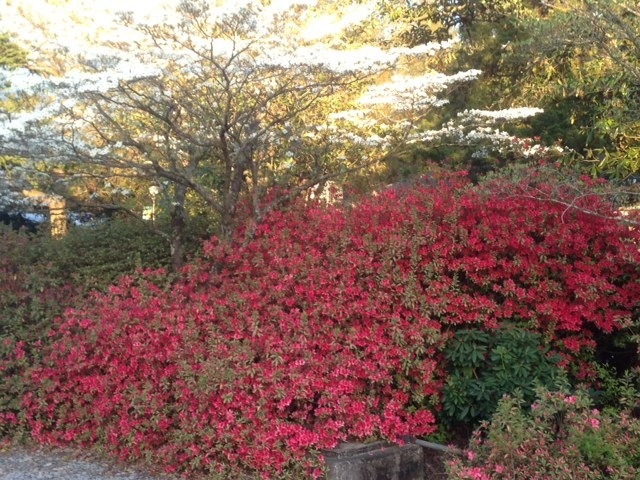 Having spent the preceding Saturday night strolling after dinner with my mother among the azaleas and dogwoods that line the railroad tracks in the center of Southern Pines, NC, I could sympathize. The surgeon of Southern origin and I settled on anemic — for spring so far in 2013 in New York City — and knew we’d keep looking for signs, intentionally looking. 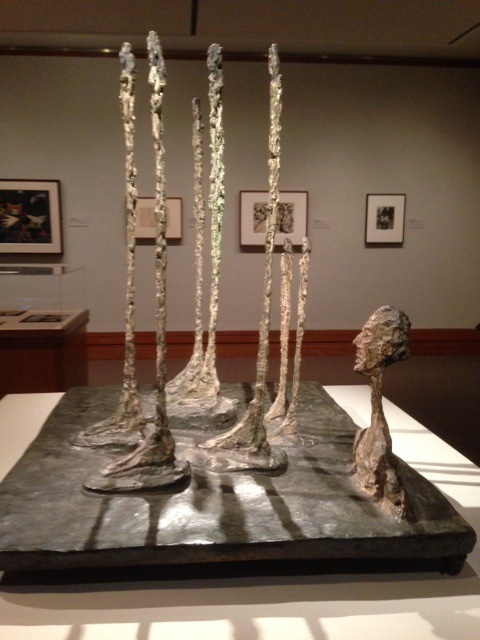 Giacometti’s The Forest (Composition with Seven Figures and a Head) stands in one of the rooms of the exhibit Street. In my mind, in the context of the entire exhibit, the Giacometti sculpture became the young cashier, soon to be mother of seven, who had been so pleasant at the grocery store in Phenix City, Alabama, three weeks earlier. The composition — connected but separate, parallel, rootedness — against the buoyant smile from behind the counter on a March Wednesday afternoon. Resolution with regard to life or work, once glimpsed, turns over, and irresolution shows through. What do we pick up and carry away from that turning? Perhaps as receivers of art, we need the dislocation after the connection. Next to the word impulse on my notes from the museum, I had copied the Latin from the wall text of a religious painting included in Street, Noli me tangere. “Don’t touch me, do not cling to me…not even if you recognize me.” A warning to pull back, acknowledge separateness — passionately. This is not not saying on the wall text, in the exhibit, in the experience, it is not silence or oppression or suppression, but irrefutable multiplicity in the midst of connection, and all that implies.